“Whatever are trams doing on Dartmoor?” is a reasonable question now we associate trams with big cities. However, a tramway is simply a light railway used for moving cargo or people. The Haytor Tramway is one created to move cargo, more specifically granite. 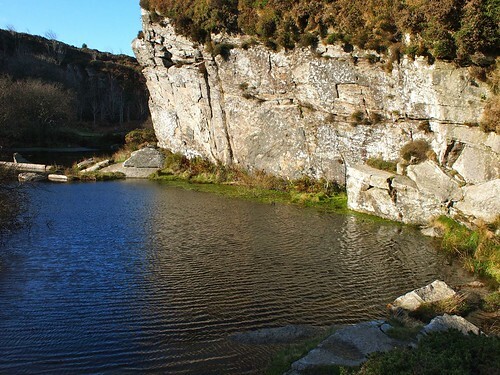 It was created in 1820 by George Templer to move granite from the Haytor quarries to the Stover Canal head at Teigngrace. George was the third in a line of Templers who literally made their mark on this part of Devon with Stover House and estate, the Stover Canal and the Haytor Tramway. 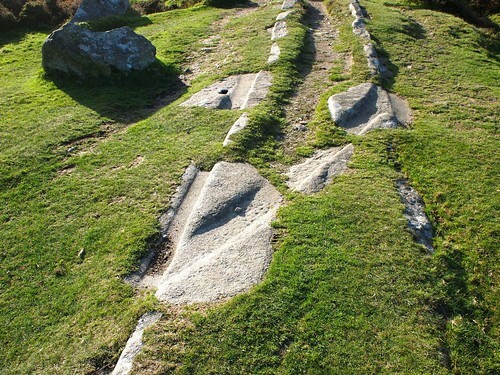 The tramway is still clear to follow as it was built from the nearest material to hand – granite! Much longer lasting than iron. Points could be carved into the granite as the photo above shows and the rails show an economy of labour typical of the industrial revolution. If you look at the rails you will see only the outer ‘L’ is cleanly finished while the inner part of the rail is left roughly finished. This is so the car wheels ran smoothly on the rails while the rest just had to clear the bottom of the car. You can easily follow the tramway from the quarry but some sections are overtaken by the moor and showing signs of neglect. Hopefully as the path is well used the remains of this mining monument will remain visible for a long time to come. I was at first disappointed this had nothing to do with the Knights Templer but is dedicated to the Templer family’s work. 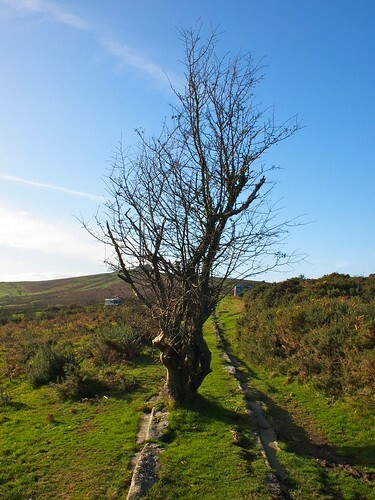 I thought medieval because of the number of medieval routes on Dartmoor. The Abbot’s way for example. Plus all the associated great stories about the monks getting up to no good! 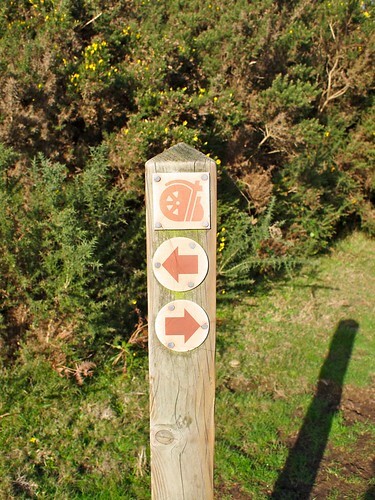 Whether you want to walk from shore to moor or vice versa the Templer Way is clearly marked. There’s also a handy information packed leaflet available that I enjoyed reading when I planned my walk. As you can see from my route mentioned above there is plenty of scope for including a section of the way with other walks. Just keep an eye out for the granite rails and rudder and wheel waymarks!